Kids and Freckles – How Cute! We love the cuteness of kids with freckles as much as you do. They are unique identifiers that give their bodies more character and personality. However, freckles can also mean regular trips to the dermatologist’s office if parents don’t practice proper sun protection methods. Freckles are a visible notification that sun damage is present on the skin. And as with moles or pigmentation issues, they could be a sign of an innate skin condition that may emerge at some point down the line. Once ingrained, kids’ protective sun-care habits become routine – year round. Thus, one of the greatest gifts you can give your children is to teach them those healthy sun protection habits from the get-go. Using Sundicators UV Wristbands are a helpful tool to guide children and teens into better sun safe habits. Sundicators are not complicated to use, infact, even a small child could use them with great success. Powered by the sun, Sundicators react according to the effectiveness of your sunscreen. When your sunscreen starts to reach its useful threshold, the wristband will start to change purple tones reminding you it is time to reapply sunscreen. Once your Wristband has lost color, it is time to seek shade for the day. 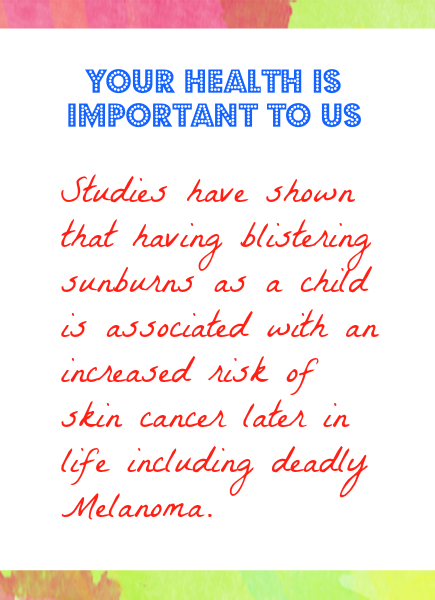 The more we learn about UV exposure, the more dangerous we know it to be; especially to tender skin. Most people think the dangers of Skin Cancer and Melanoma only effect “old people”; nothing could be further from the truth. Children are susceptible to the sun’s dangers at any age; however if proper sun care is practiced from their earliest ages, it could very well save their lives. Start young. Stay the course.